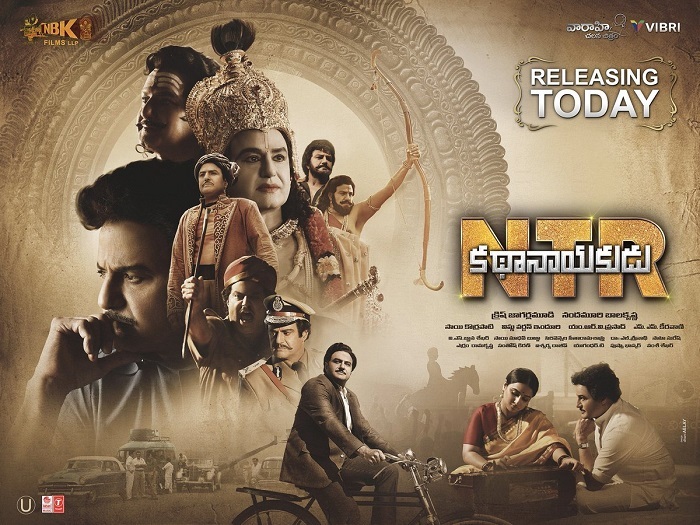 `NTR Kathanayakudu’ is a Satisfying watch showcasing the filmy and family life of Legendary NTR. It is all about the rise of NTR (Balakrishna) in Telugu Film Industry and Reasons leading towards his political entry. NBK proves to be an almost perfect fit especially as the character of NTR matures. He has enacted some well known episodes of multiple Blockbusters with a great ease. Vidya Balan is good and adds class and grace to a little known character. Sumanth and Kalyanram also got notable run time on screen and are good too. Music: Good. Background score is Superb. NTR Biopic is a rare Family film from Balakrishna who is well known for Mass Action Entertainers. This Part-1 is a show case of NTR’s rise in the film industry and also about his little known family life. Krish has managed to dish out an Emotional and Entertaining film which can be watched with your entire family. NTR’s various Historical/Devotional avatars and his love for people steal the limelight in this film which is probably a little too long and is dragged at times. Nevertheless you scan easily watch it once and it will be largely a satisfying experience. The film was sold for highest rates ever in NBK’s career and it is probably a tough ask. Should have a good run though.